Glycerites are sweet herbal tinctures which use vegetable glycerin to extract the active constituents and flavor from an herb. Herbal tinctures are typically made from alcohol, but glycerin is a good alternative for children, animals, and adults when palatability and alcohol sensitivities are primary considerations. While not as potent as alcohol-based tinctures, glycerites are still quite effective – certainly more so than trying to administer a dose of alcohol-based tincture to a tight-lipped child! Glycerites are effective no matter what reason you have for wanting to make tinctures without alcohol as the base. Fresh plants are ideal for glycerin tinctures because glycerin excels at preserving the fresh plant juices. However, glycerin is not as effective as alcohol at drawing constituents out of the cell structure of dried plants (Cech, 2000). Fresh flowers and aromatic plants such as lavender, lemon balm, mint, chamomile, violet and rose can be used to make particularly delightful glycerites that are lovely mixed into iced or hot herbal teas, fruit sauces, and cocktails, or drizzled over yogurt, ice cream, and desserts. Lavender glycerite and chocolate cake? Yes, please! Dried elderberries and fresh echinacea roots can be used to make effective glycerites (Cech, 2000) to support immune response to infections such as colds and flu. Glycerites can also be mixed with alcohol-based tinctures to sweeten them. Lemon balm glycerite is a welcome addition to St. John’s wort tincture for mood support during the long winter months (use approximately 4 parts alcohol tincture to 1 part glycerite, or to taste). The arrival of spring in New England brings the sweet and hardy little violet, whose purple, yellow, and white blooms are a sight for sore eyes and a balm for our hearts, lungs, and skin. The spring blossoms are not seed-bearing (those come in the autumn), and are delightful in salads, teas, honeys, and – you guessed it – glycerite. Let’s celebrate by preserving violet’s qualities to enjoy throughout the year, and let’s make this tincture without alcohol. Fill a clean jar with clean, chopped fresh plant material or half-full of ground dried plant material (dried material will expand as it absorbs liquid). For successful preservation, a glycerite tincture should contain at least 55% glycerin (Cech, 2000). For fresh plants, add enough glycerin to fully cover the plant material and fill jar to within one inch of the top. For dried plants, dilute glycerin with distilled water in a 3:1 ratio (3 parts glycerin to one part water) and fill jar with mixture to within one inch of the top. Use a knife or chopstick to poke into plant material and release air bubbles while adding glycerin or glycerin/water mixture. Cap and label jar, and set the jar in a dark location at room temperature. Let macerate for 4-6 weeks, shaking the bottle every day or two to mix. Top off with glycerin as necessary if plant material pokes above the top of the liquid. After 4-6 weeks, decant glycerite into a jar or bowl by pouring through a strainer lined with a few layers of cheesecloth. With clean hands, gather corners of cheesecloth together and squeeze herb material to express every last drop of glycerite. Glycerites have a shelf life of approximately one to two years if stored in a cool, dark place. Adult dosage is typically approximately 30-60 drops (1/4 – 1/2 teaspoon), 3 times daily, taken in a little water. Are you interested in learning more about the benefits of herbalism and how to make other herbal preparations? 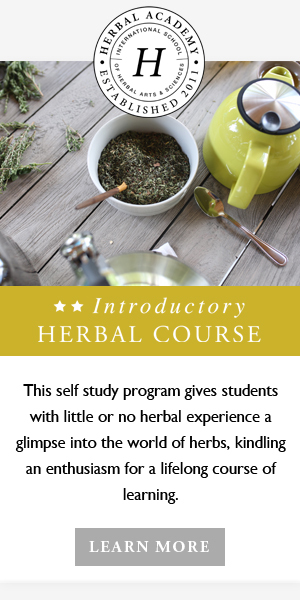 We invite you to learn more in the Online Introductory Herbal Course or in the Online Intermediate Herbal Course. Join us as we discover the wild and wonderful world of plants!